The Scoop: Founded in 2012, Tawkify is a modern matchmaking company intent on changing the way singles meet one another and fall in love. A national network of matchmakers support relationship-minded singles with a more effective and personalized alternative to online dating. Tawkify’s affordable services have made it easier than ever to meet someone with relationship potential. The matchmaking firm employs over 160 matchmakers who search through a database of 200,000 singles to find the most compatible dates for their clients. Tawkify has spent years growing its reach and perfecting its services to meet the needs of busy professionals who don’t have the time or energy to scour the dating scene on their own. Tawkify, a concierge matchmaking service, doesn’t simply hand new clients over to the nearest matchmaker on the payroll. An executive team pairs up clients and matchmakers with as much care as they select dates. That means they evaluate the individual’s personality type, temperament, and dating history to find a compatible fit. During this process, the matchmaker’s proximity doesn’t matter as much as his or her background. It’s important for the client to trust the matchmaker, and it’s important for the matchmaker to relate to the client — because that relationship often determines the success of the matchmaking process. All in all, Tawkify’s team spends quite a bit of time ensuring they put each and every client into good hands. Tawkify is a fast-growing matchmaking firm that has paired up hundreds of happy couples in the US. E. Jean Carrol and Kenneth Shaw founded Tawkify in 2012 to give successful, career-driven professionals a stress-free way to meet eligible dates and find love. They established a blueprint for a hands-on and technologically advanced matchmaking system, and it has since spread across the country. Today, Tawkify has the largest digital matchmaking network in the US. Over 200,000 dateworthy individuals are in Tawkify’s coveted Romance Rolodex, and that number is growing all the time thanks to a passionate team of recruiters. Tawkify has a strong presence in major cities across the US, and its match candidates are so widespread the matchmakers can confidently take on clients living just about anywhere in the country. The matchmakers who work for Tawkify come from a variety of professional backgrounds. Some were lawyers before they found their calling as a matchmaker. Others were yoga instructors, travel bloggers, or couples therapists. They landed a standing gig at Tawkify not because of what they’ve done but because of who they are. The company seeks out matchmakers who are incredibly empathetic and have an intuitive understanding of human nature. Tawkify matchmakers use their intuition and experience to select matches. Today, Tawkify has over 160 matchmakers, and all of them are enthusiastic, professional, and caring individuals who got into the dating industry to make a difference in people’s lives. That’s the mission that drives Tawkify forward, and it’s something that’s always in the minds of team members. The matchmakers are primarily US-based, but a few live abroad in Europe and work with clients remotely. Even if they don’t live in the same cities as their clients, the matchmakers make themselves available to clients via phone or Skype and provide personalized feedback on everything from what to wear on a first date to how to ask for a second date. Recently, the team has started gifting its engaged and married clients with a professional photo shoot to celebrate their union. Couples can take advantage of this service by letting the matchmakers know they’re on their way to a happily ever after. Michele said they’ll even sometimes throw in a professional hair or makeup stylist to pamper the couple and thank them for trusting Tawkify’s matchmakers. “It’s about celebrating them all day,” she said. Tawkify has the capacity to take on up to 3,000 clients at a time. Its national network of matchmakers arrange hundreds of dates each week and facilitate relationships for singles who may be too busy to scour the dating scene on their own. These days, finding people isn’t really an issue (all it takes is a few swipes), but it’s still incredibly difficult and time-consuming to find the right person. That’s where working professionals can struggle. The simple and efficient matchmaking services offered by Tawkify appeals to time-conscious daters who want to maximize their time in the modern dating scene. They want to spend more time meeting dates than looking for dates, so they outsource the search to recognized professionals in the matchmaking industry. Tawkify sees clients as young as 21 and as old as 81, but the majority of clients are around 35-55. Its network is diverse, with a relatively equal gender split, but everyone who joins Tawkify shares a deep desire to find love and get in a fulfilling relationship. The matchmaking service is all about dating with a purpose. These well-trained and tech-savvy matchmakers excel at pinpointing long-term compatibility and pairing up people who are ready for a commitment. In the last few years, Tawkify has honed its processes, expanded its database, and collected hundreds of success stories from across the country. The matchmaking firm has become one of the top dating services for busy professionals by analyzing what singles need and providing reliable and cost-effective shortcuts to romance and relationships. “If Tinder is the virtual equivalent of trying to find the love of your life at a bar, Tawkify is getting set up by a friend who knows you and what you’d want in a partner,” said Brandon, who met Ashley through Tawkify and proposed to her two years later. Ashley had only been in Tawkify’s database for a few months before she hit it off with Brandon. Denver resident Dia said hiring a matchmaker was the best decision of her life. “The experience was absolutely easy, fun, and successful,” Dia said. “The quality of my dates were high and in line with what I was looking for.” Dia is now engaged to Abbas, who was her fifth Tawkify match. Michele told us that most clients meet someone and go on to form relationships within 6-12 months of hiring Tawkify’s matchmakers. What’s more, 70% of clients match with someone (meaning they both want to see each other again after the first date) at least once within the first three introductions. Tawkify’s careful deliberation sets it apart from other large-scale matchmakers in the dating industry. Although it has grown into a nationwide operation, the matchmaking firm still operates very much like a boutique service with personalized recommendations and hands-on team members. 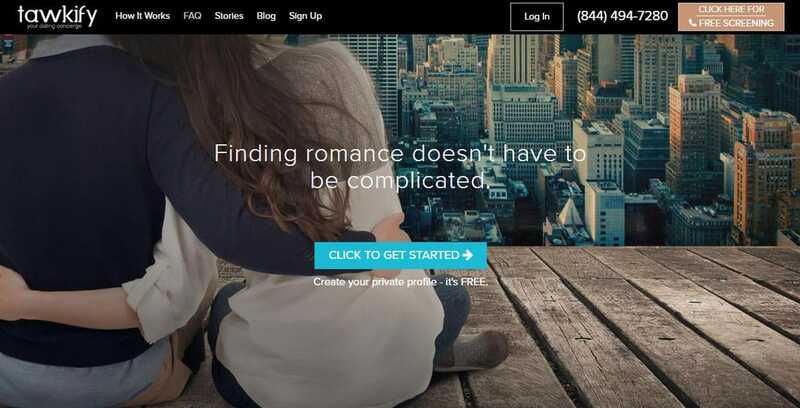 Its breathtakingly large database, high-tech tools, and personal approach to matchmaking has led the company to become one of the most successful dating services in the US. Whether they’re arranging dates or referring clients to an on-staff matchmaker, the Tawkify team puts the best interest of their clients first and makes a decision based on years of experience. Looking to the future, Michele said the team plans to continue pushing the boundaries of what a matchmaker can do and build as large and as diverse a network as possible.